Sinking one's time into a video game is a perfect escape from a broken heart, but for Tyler Schultz, that might not be the case when it comes to Insomniac's Spider-Man. Back in May, Schultz had been scheming with the developer to hide a marriage proposal somewhere in the game. Everything seemed like a sure thing, but in the weeks leading up to Spider-Man's release, Schultz's girlfriend left him. For his brother, no-less. The full details behind the saga can be found in a heart-felt (and sleep-deprived) video Schultz uploaded to YouTube. Since then, Insomniac's art director Jacinda Chew has offered to change the sign in an upcoming patch. 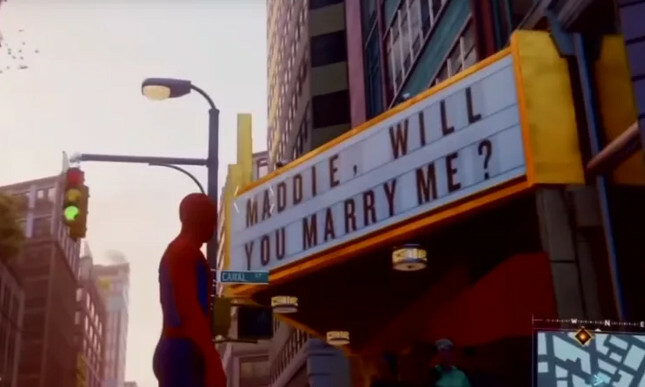 While Schultz initially wanted to keep the sign as "the saddest easter egg ever", he has since told Kotaku that the sign will become a tribute to his grandmother, who got him into Spider-Man in the first place. We're absolutely thrilled with Spider-Man, with Dan scoring it 9/10 and calling it "a true super hero epic."